Creating an understated, effortless look for a custom isn’t easy. It takes a good eye and a carefully considered approach. 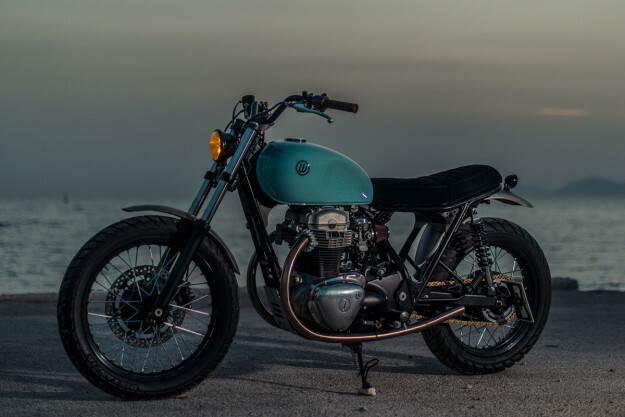 That elusive blend of minimalism and timelessness is exactly what Bike EXIF reader Michael Korkaris had in mind when he set out to build his new daily runner. 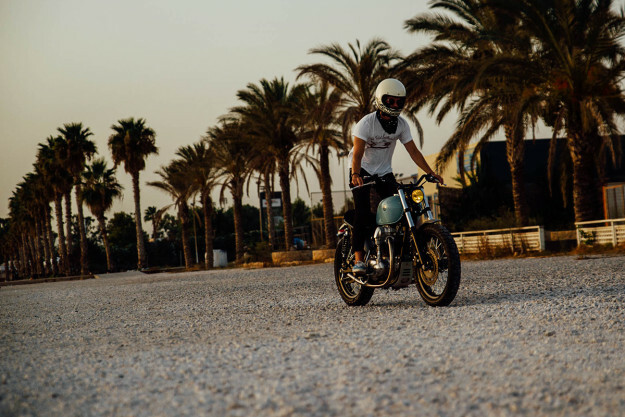 Influenced by the Eurocentric ‘new wave’ custom scene, the Athens-based web designer drew inspiration from outfits like Cafe Racer Dreams and Auto Fabrica. 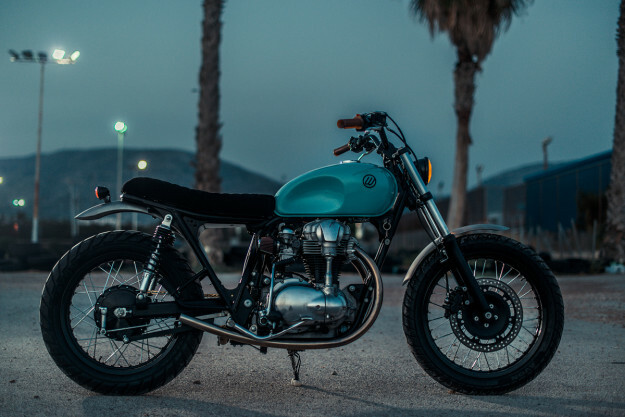 His donor bike of choice couldn’t have been more appropriate—a 2003-model Kawasaki W650, bought from an old British surf instructor on the island of Rhodes. 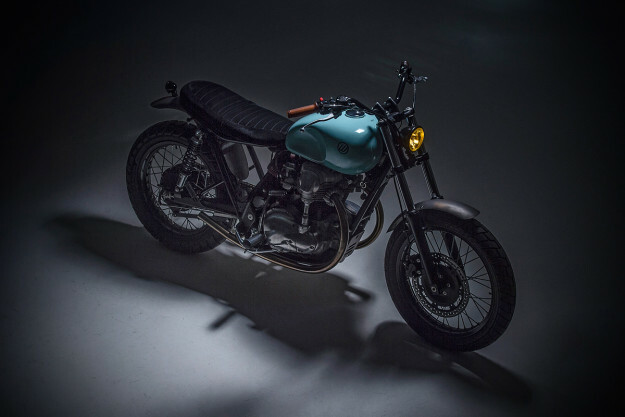 Given those origins, and Michael’s admiration for the ‘new wave’ scene, he’s called his W650 ‘The Wave’—setting the tone for the rest of the build. Michael opened Photoshop and sketched out all of his ideas, diving head first into the planned mods. But when he found himself trimming fenders in his kitchen (which was covered in steel dust), he realized he needed reinforcements. “Although I started the build on my own, I needed someone with the right tools and the right knowledge to materialize my design,” he admits. With Tom on board, the project quickly gained momentum. Living in Rhodes’ salty and humid conditions had left the bike in dire need of a refresh, so everything was stripped, cleaned up and repainted. And then, for extra insurance, BikeShine coated everything in Ceramic Pro—a nano-ceramic coating that’s water resistant and scratch proof. The engine got a decent service too, and a new set of K&N filters. Michael wanted the under-seat area as open as possible, so he ditched the airbox and relocated the electronics to a discreet tray under the seat and behind the triangular frame gussets. 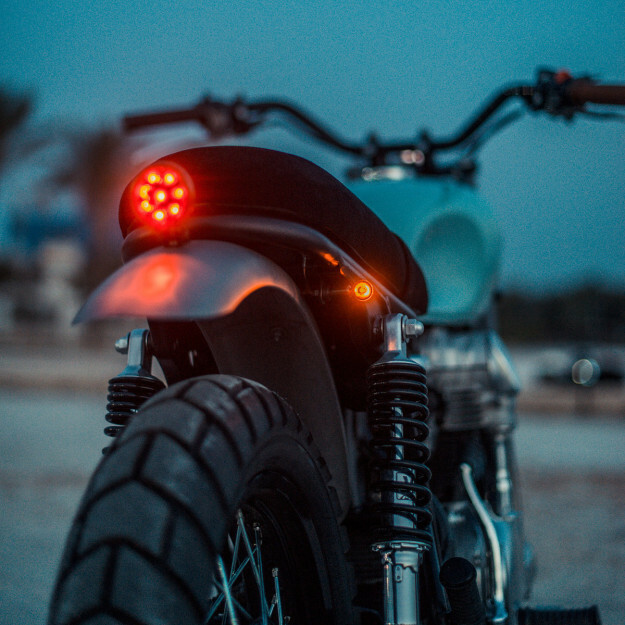 The battery was swapped for a Lithium-ion unit, and moved to below the swingarm. Michael shaped the seat himself, and then sent it off for a synthetic suede, double-stitched upholstery job. BikeShine applied their coating here too; any water that hits it now beads on the surface. There’s also a simple, cable-actuated quick-release mechanism to pop it off in a jiffy. 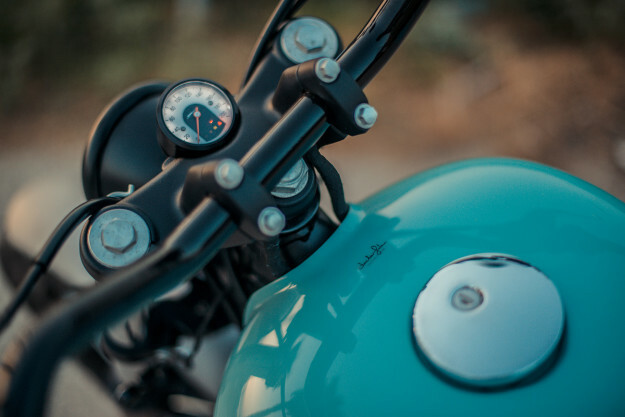 The W650 comes from the factory with tank kneepads, mounted on rather unsightly brackets. These were shaved off, and the tank’s sides beaten in and re-shaped to be more pronounced. 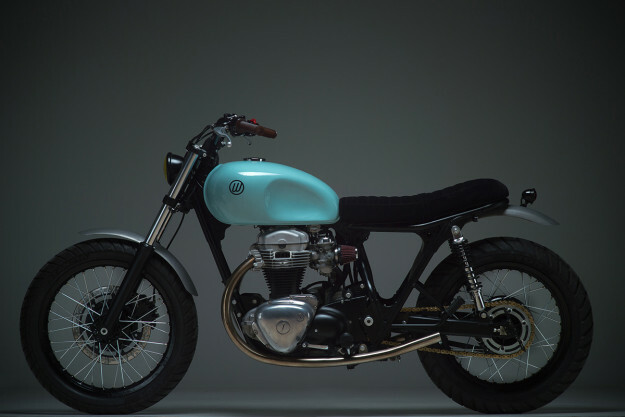 It was then sent off to Doctor John to be repainted in an emerald-green-blue combo, as a nod to the oceanic theme. The small “W” logos are Michael’s own design—they’ve been done in a pearl paint that shows up blue in direct light. 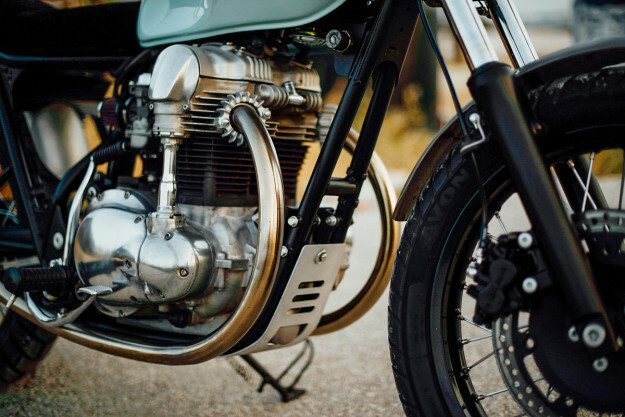 A gorgeous, swooping stainless steel exhaust system draws the eye from front to back, with sandblasted stainless steel fenders capping the bike at both ends. Though the exhaust seems wide open, internal baffling’s been added in an attempt to keep noise levels reasonable. Both wheels were relaced with stainless steel spokes, and wrapped in Avon Distanzia rubber. And the frame was treated to a fresh matte black powder coating. The rest of the bike is a case study in careful parts selection. 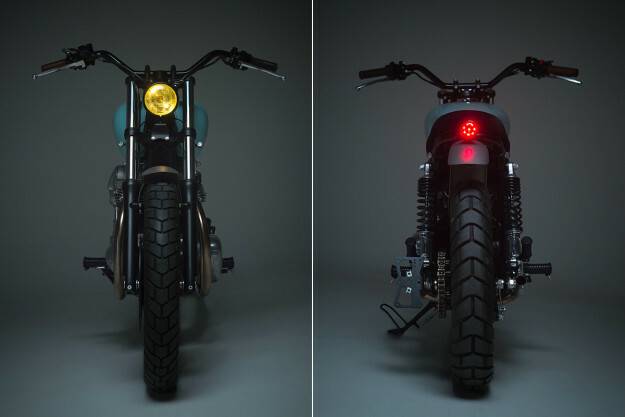 There are Bates-style head and taillights, discreet LED indicators and a tiny Motogadget speedo where the ignition used to be (it now lives on the right hand side of the bike). 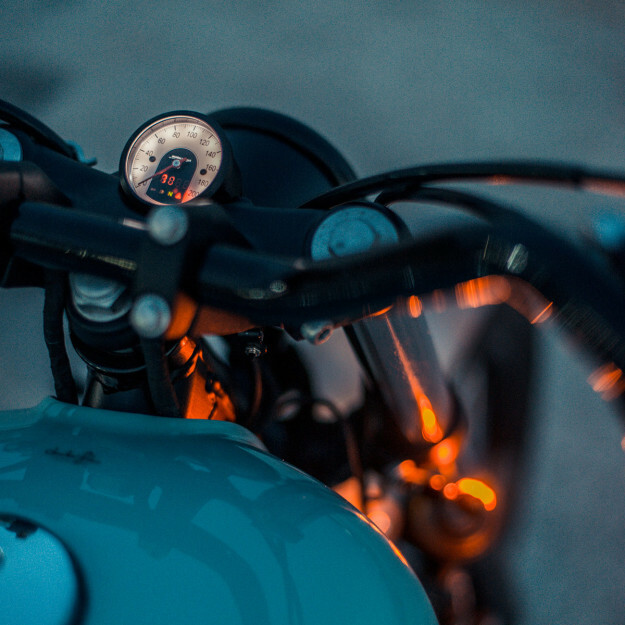 The handlebars are from LSL, with all the necessary cockpit wires rerouted to inside them. 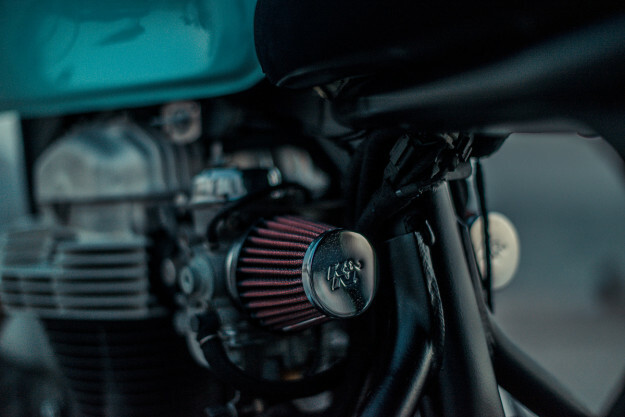 The guys have finished the W650 off with some neat hand-made touches too, like front indicator mounts that run off the triple clamp bolts. And the aluminum skid plate is also their design—it’s a part that they plan to offer for sale soon. 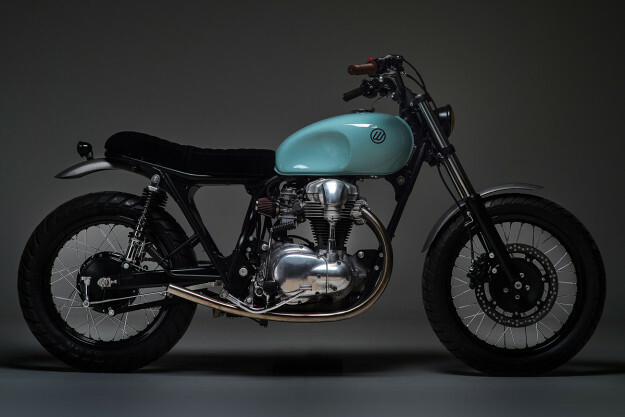 Tom and Michael’s unexpected hook-up has produced one of the freshest W650s we’ve seen. It’s also spawned a promising partnership: the boys have now launched Urban Mechanics, and already have two more bikes on the bench. If they turn out half as cool as this beach-cruising W, we’re in for a treat.